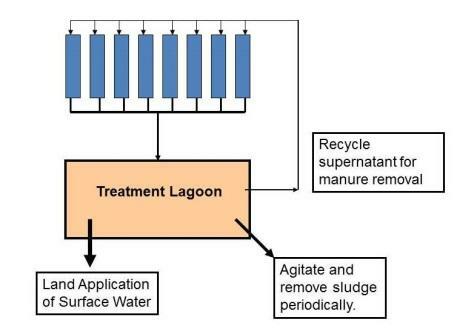 Why Study Manure Treatment Lagoons? Treatment lagoons are one of the most common biological treatment methods used on swine and dairy farms that use recycled supernatant as a means to remove manure from animal housing facilities by flushing. A properly functioning treatment lagoon will provide adequate treatment to allow reuse of the effluent without compromising animal health or generating strong odor. A typical treatment lagoon system used on swine and dairy farms. A lagoon should have a minimum biological treatment volume and provide sufficient volume for settling and storage of sludge to provide the needed levels of treatment prior to recycling. This presentation will provide a summary of the benefits of using liquid-solid separation to maintain and potentially reduce the required treatment volume, reduce sludge build-up, increase useful life of an existing lagoon, and to reduce the size of new lagoons based on the ASABE Standard. Information will also be provided concerning desired loading rates and supernatant concentrations for recycling, and impacts of odor production potential. Components of a treatment lagoon for animal manure. The ASABE Lagoon Standard (ANSI/ASAE EP403.4, ASABE 2011) was used to calculate lagoon treatment volumes for swine and dairy manure using volatile solid loading rates for a variety of climates ranging from a cold climate, such as Southern Minnesota (3 lb VS/1000 ft3-day), to a hot climate, such as Central Florida (6.0 lb VS/1000 ft3-day). Liquid-solid separation methods can provide a reduction in the mass of VS in the liquid fraction by 10% to 80%. The corresponding reduction in treatment volume were also determined for swine and dairy manure over a wide range of climates. The ASABE Standard also provides a method to estimate sludge storage volume requirments per year for swine and dairy lagoons that is based on the total solids loaded into a lagoon. The impact of implementing solid-liquid separation on the sludge accumulation rate was also destermined for TS removals in the range of 20% to 80%. The percent reduction in treatment volume of a lagoon was the same as the mass fraction of VS removed by liquid-solid separation. That is, a 30% reduction in VS provided a 30% reduction in treatment volume. The practical result is that implementation of liquid-solid separation system that can remove 30% of the VS would allow pork producers in the Midwest to use similar treatment volumes as pork producers located in South Carolina or Central Georgia. Liquid-solid separation also reduced sludge build up in lagoons by the same percentage as the TS removal efficiency. Therefore, a 30% reduction in TS will reduce sludge accumulation by30%. Reduction in TS and VS loading can help to reduce odors from lagoons, reduce the size of the lagoon needed to provide treatment, and can yield better treated surface water for flushing manure from the buildings. Removal of large portions of the VS (60% to 80% reduction) using high-rate liquid-solid separation methods has the added benefit of greatly reducing the amount of the organic-N loaded. As a result, less organic-N will be converted to ammonium-N in a lagoon where a portion will be lost to the air as ammonia. This information will be published as part of a new USDA-NRCS technical note or as part of the National Engineering Handbook, Part 651 Agricultural Waste Management Field Handbook. 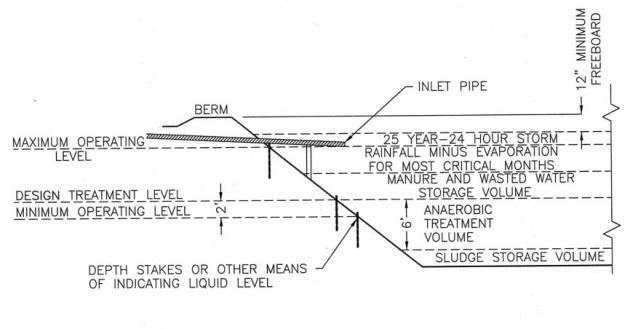 Solid-Liquid Separation Alterntives for Manure Handling Treatment, a new USDA-NRCS technical note or as part of the National Engineering Handbook, Part 651 Agricultural Waste Management Field Handbook. Piedmont-South Atlantic Coast Cooperative Ecosystems Studies Unit (CESU). This Cooperative and Joint Venture Agreement allowed for this work to take place. Additional support was provided by the Confined Animal Manure Managers Program, Clemson Extension, Clemson University, Clemson, SC.